Prices in the prime areas were the most affected over the past three years compared with other segments of the residential market, says Tay Kah Poh, executive director and head of residential services at Knight Frank. And buyers now feel that prices for high-end properties in Singapore are more affordable than in cities such as London or Hong Kong, he adds. Tay points out that an apartment in Hong Kong made the news for selling at a record-breaking price of $22,923 psf on Nov 21. As a result, demand has returned to Singapore’s luxury segment. Four luxury condo units transacted at prices above $9 million in the week of Nov 7 to 14. The priciest unit sold was a 7,984 sq ft, penthouse villa unit at Reflections at Keppel Bay. It was sold for $12.78 million ($1,600 psf) on Nov 9, the highest price in terms of quantum for a unit at the project, so far this year. A 2,905 sq ft unit was sold for $10 million ($3,441 psf) at The Nassim on Nov 9. 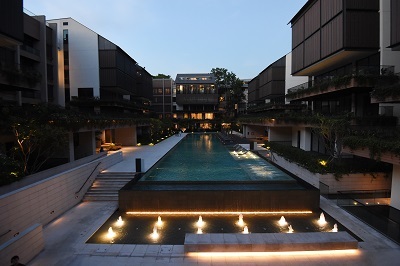 It is one of 45 units purchased in January by Kheng Leong Co, which is controlled by the family of Wee Cho Yaw, chairman emeritus of United Overseas Bank. Kheng Leong paid $411.6 million, or about $2,300 psf on average, for the units, which reflects an 18% discount over the average transacted price at the time. According to caveats lodged with URA Realis, three out of the 45 units bought by Kheng Leong have been sold so far, at prices well above $2,300 psf. In September, another 2,905 sq ft unit was sold for $9.88 million ($3,400 psf), while a 9,300 sq ft unit fetched $25.6 million ($2,750 psf) in May. Over at Ardmore Park, prices have been climbing since the start of the year. On Nov 14, a 2,884 sq ft unit on the 19th floor transacted for $9.3 million ($3,224 psf). This is the 16th unit sold at Ardmore Park this year, which is more than double the seven units sold last year.